Welcome to the Fifth and Sixth Grade Classroom. 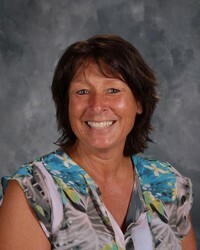 My name is Kathy Mackenthun and I am pleased to be the teacher in this classroom. I have been teaching at Emanuel since I began my teaching career in January, 1981. My husband and I have been married since 1982. We have three children: Amanda, who resides with her husband, Mike, in Killeen, Texas; Jeffrey, who is living in Boston, MA and works for Liberty Mutual; and Scott, who recently moved to West Hartford, CT, and is working for The Hartford. Mike and Amanda also have a daughter, our first grandchild, Sydney Christine. I am blessed to be at Emanuel. If you would ever like to stop in and see our students in action, we would heartily welcome you.